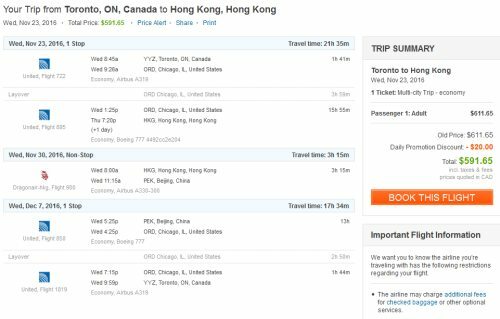 There are some amazing airfares available from Toronto that allow you to visit both Hong Kong AND Beijing, China for just $591 CAD roundtrip including taxes. The flight between Hong Kong and Beijing is included. Aug 28 to Sep 04 to Sep 11 -- new! Sep 4 to Sep 11 to Sep 18 -- new! Sep 22 to Sep 29 to Oct 06 -- new! Sep 25 to Oct 02 to Oct 09 -- new! Oct 20 to Oct 27 to Nov 03 -- new! Oct 27 to Nov 03 to Nov 10 -- new! Nov 03 to Nov 10 to Nov 17 -- new! Nov 06 to Nov 13 to Nov 20 -- new! Nov 13 to Nov 20 to Nov 27 -- new! Nov 20 to Nov 27 to Dec 04 -- new! Nov 24 to Dec 01 to Dec 08 -- new! For longer trips you can try mixing and matching the departure and return dates from the examples above. 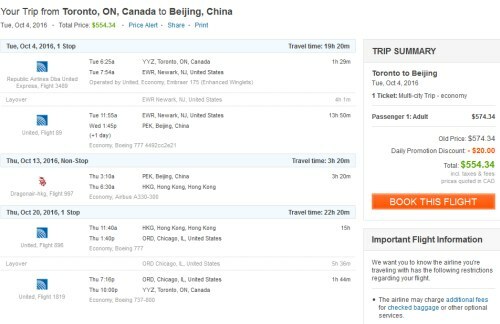 Update 8/17 - There are now flights available where you fly to Beijing first, and Hong Kong second, and they are even cheaper, at $554 CAD roundtrip including taxes! toronto, yyz, flight deals, asia, east asia, beijing, china, pek, hong kong, hkg and united airlines.